Yesterday the other half said he was hankering after a burger. I’m not really a big burger fan, don’t get me wrong, I like a good gourmet one now and then, but it’s not something I would usually decide to make at home. After much Googling around on the debate over whether or not a burger should include a binding agent such as egg or not, we decided to fall on the side of the meat purists. 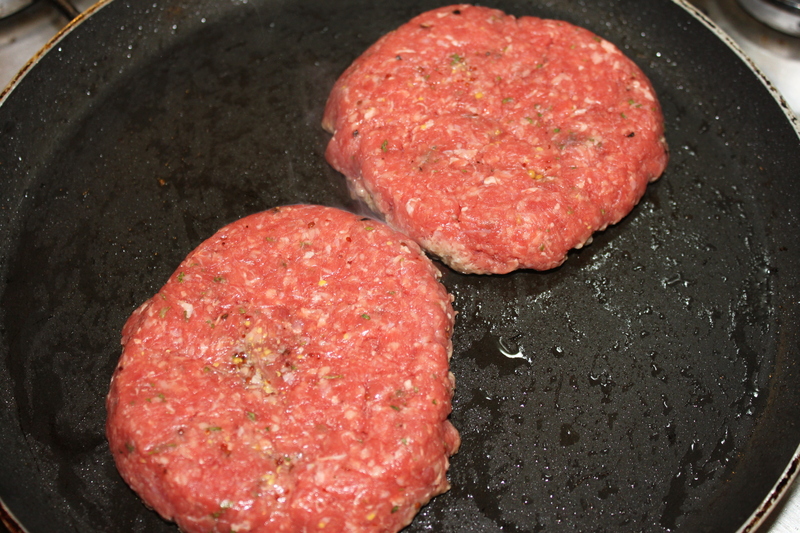 According to them, a burger should hold together no problem as long as you press the meat between a burger press or similar and allow to chill in the fridge for long enough. We mixed together the mince with the parsley, mustard and seasoning, then used our customised burger press (the plunger of a cafatiere, some cling film, and a small bowl!) to press into compact burgers. Then we popped them in the fridge and left to chill for a good few hours. 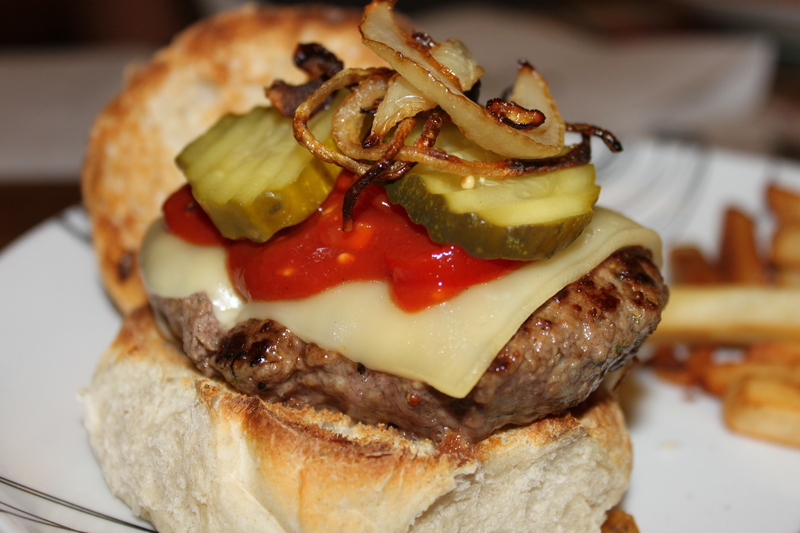 I think next time I make these, I would be a little more adventurous and perhaps add some little chunks of apple or something similar to add another flavour dimension, but these make for a good classic burger. 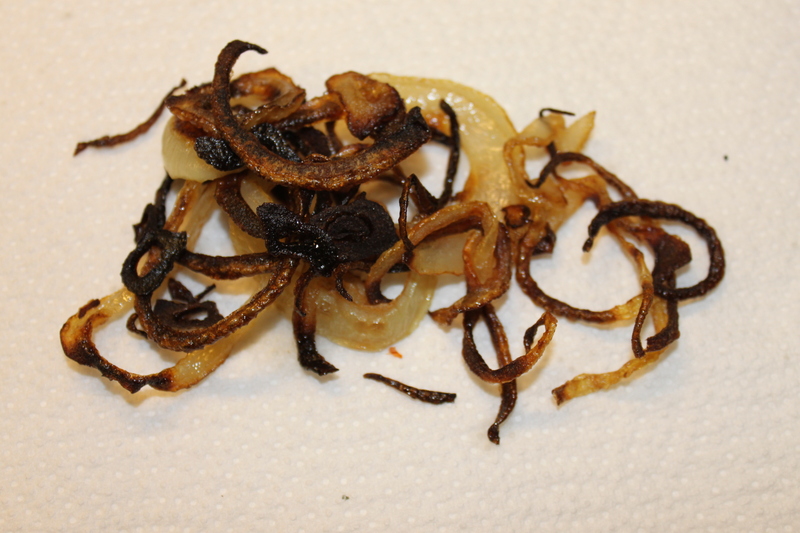 To achieve the crispy onions, we thinly sliced half an onion, fried it in a hot pan on a high heat for a minute or two, until slightly caramelised, and then baked at low to medium heat for another few minutes until browning. 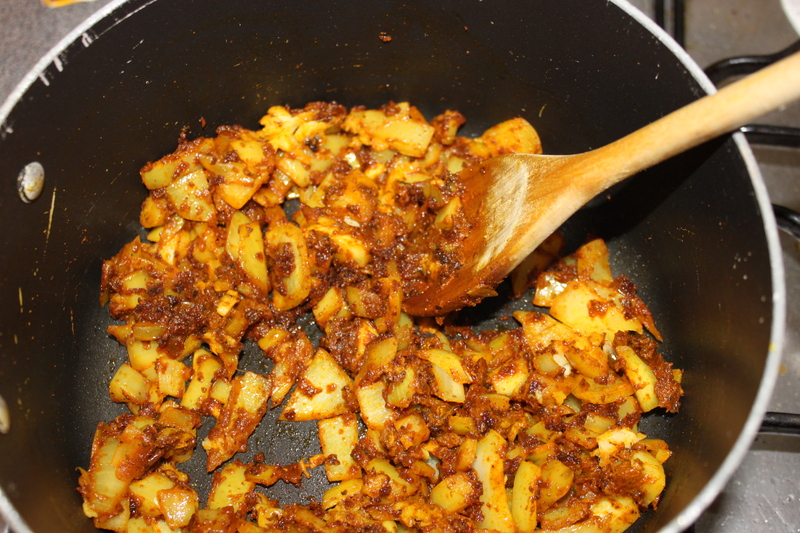 I had also planned to add a little finely chopped red onion, but didn’t seem to have any! 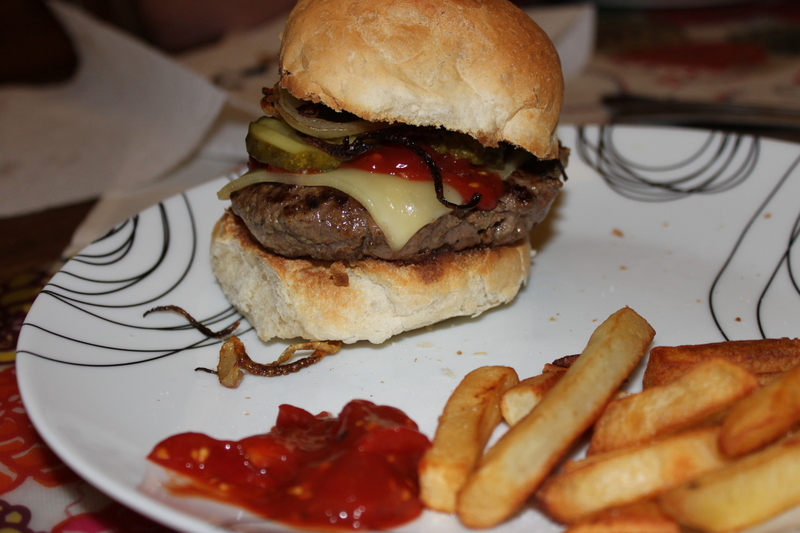 For the all-crucial burger bun, we were lucky enough to happen on a roll that was a happy medium between too crusty and too cloying and cotton wool like (which I hate, eugh!). We toasted the inside of the rolls under the grill, but left the outside bread-like. 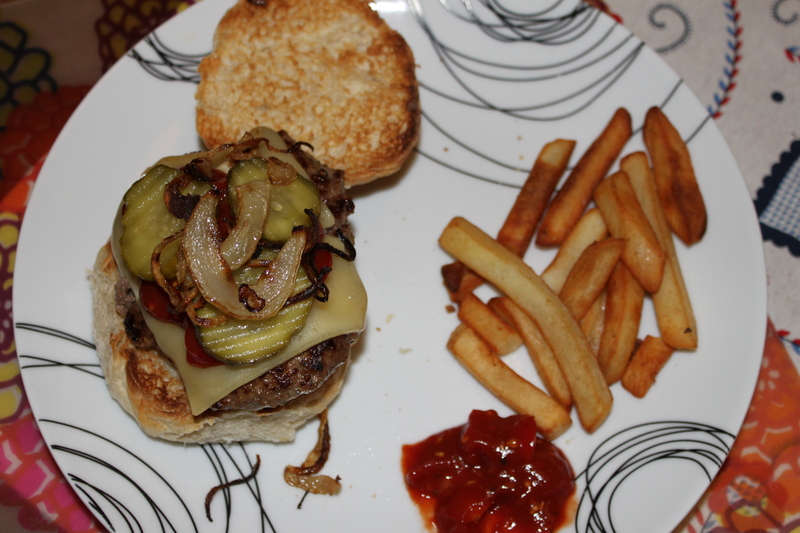 There’s definitely room for a little tweaking with this, but as a first attempt at the classic beef burger I was pretty pleased with it, and you can go crazy with the toppings, whatever you fancy! 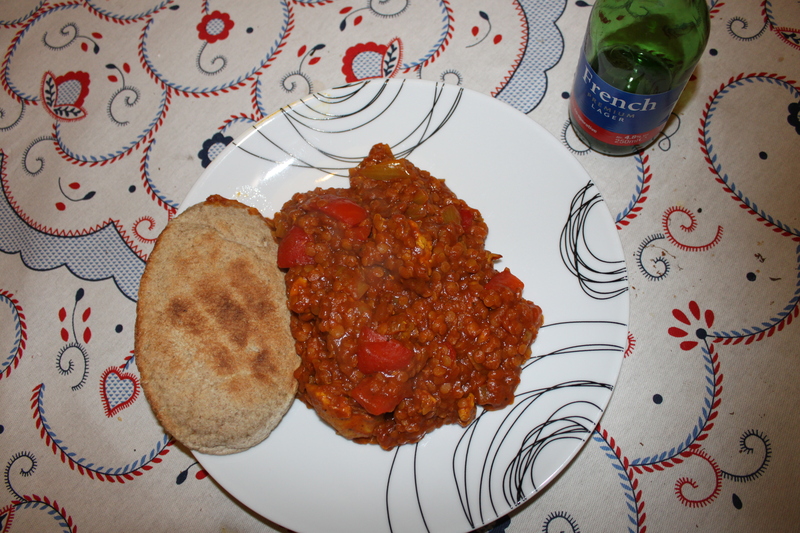 This is a curry I first made a few years ago, from whatever I could find in my kitchen. Rob had been away for 10 days walking the Coast to Coast (The Wainwright Coast to Coast for those of you that don’t know it). England may be a relatively small country, but walking from one side of it to the other is still a fairly impressive feat, particularly as Rob went ahead with it on his own despite his friend pulling out of the last minute. And the fact that the crazy poor boy was particularly unlucky with the weather, resulting in a pretty continuous soaking for must of the journey. So, after 10 wet, lonely days, he reached his final destination – Robin’s Hood Bay on the North Yorkshire coast, and proceeded to toss the stone he had picked up from the start of his walk at St Bees on the Cumbrian coast into the sea on the opposite side of the country. He then phoned me from the train station telling me that he had made it, that he would be home in a few hours, and that he was practically hallucinating at the prospect of a hot bath, a curry and a beer. Once ensuring there was hot water and bubble bath, I cried “to the kitchen!” I must make my crazy darling man a curry! 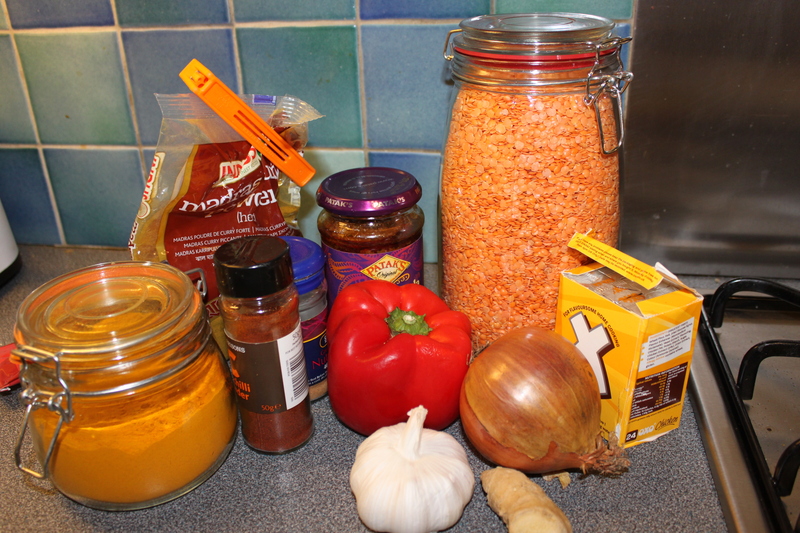 On entering the kitchen however I found there to be none of my usual curry ingredients – fresh chillis, rice or mustard seeds. I peered out the window, “hhmm looks a bit wet and blowy out there. Not sure I want to walk to the shop…” (The irony of this does not escape me given the journey that he had just made). I shall be inventive and concoct a new curry instead. Thank god there were at least beers in the fridge! And so one of our favourite currys was born; the chicken and red lentil. 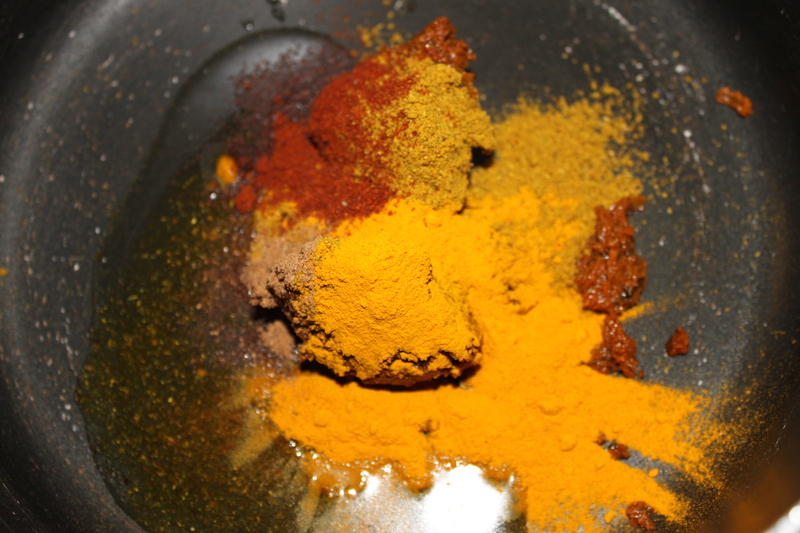 Heat a little oil in a pan and add the curry paste, curry powder, tumeric, chilli and nutmeg. Then add the chopped onion, crushed garlic and grated ginger (grate the ginger straight over the pan to keep all the flavour!) 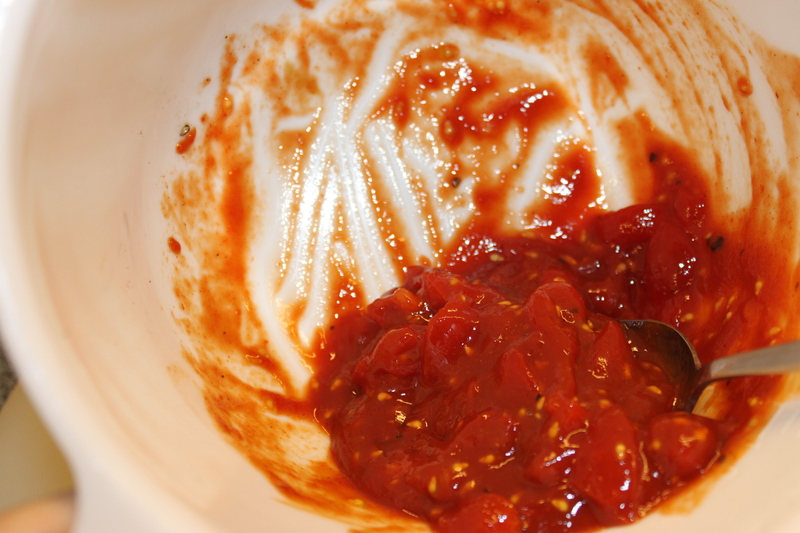 Fry for a few minutes until softening. Stir in the diced chicken and then the roughly chopped red pepper and cook on a fairly high heat for around 5-10 more minutes. 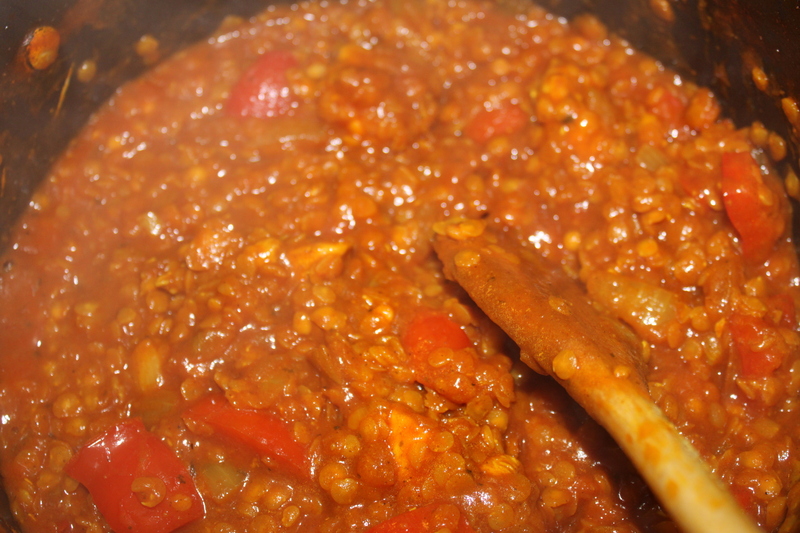 Add the rinsed lentils, the chicken stock and the tomato puree and leave to simmer for around 20 minutes – until the lentils have cooked. 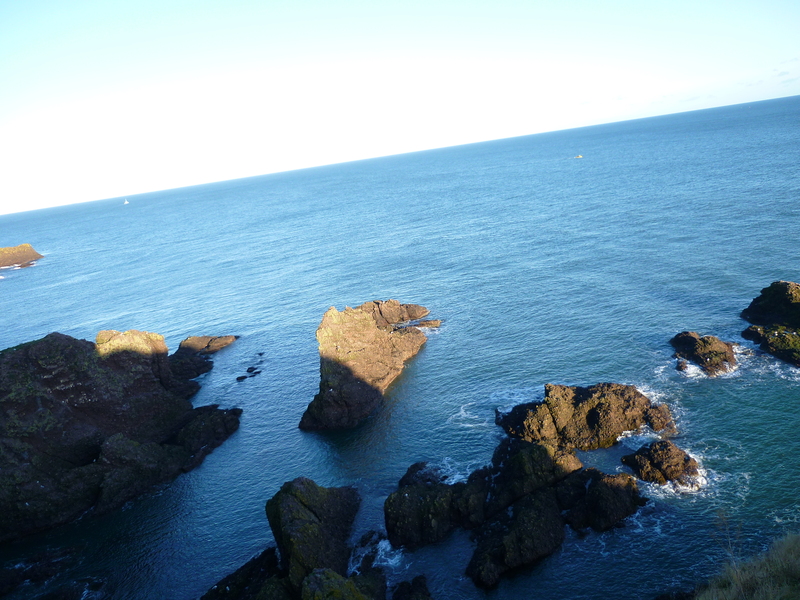 Last weekend I went to Aberdeen to visit a friend. Aberdeen is the city where I went to university and it’s always a happy occurrence for me to return. Sadly there are a lot less of my friends still living there now with people moving on to pastures new over recent years, but I still get up there for a visit every now and again. Whenever I’m in Aberdeen I always feel very nostalgic, I think this is probably common for anyone who doesn’t still live in the same place where they went to university. I feel a strong connection to a younger version of myself and to old friends and relationships. It’s strange how so many streets, restaurants and bars have strong connections to a certain person or event yet I don’t feel this nearly as much in Manchester, where I’ve actually been living for longer than I was in Aberdeen. 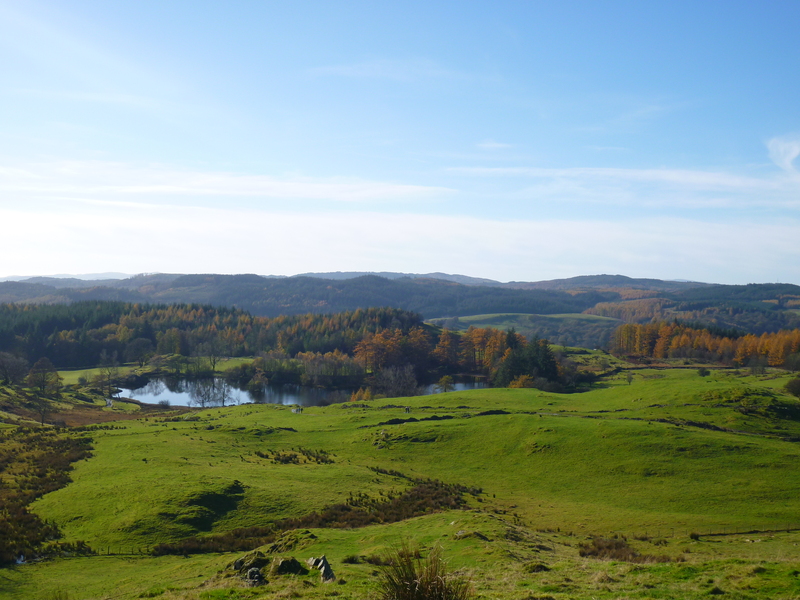 Being there last weekend really made me miss Scotland and miss a time that seemed so much more simple care-free and where I felt a lot more independent than I do now here in Manchester. I used to know Aberdeen so well and could get around by myself easily, I still find Manchester a confusing place at times and find it overwhelmingly large. In Aberdeen, as a student, I had a clear purpose and was passionate about what I did. Now I’ve joined the real world and often wonder how I’ve ended up spending my days as I do and where I’m supposed to go next. Still, Manchester is where I met Rob and is where we have our lovely little house so things aren’t so bad! Aberdeen obliged and was its usual brilliant blue and sunny self, lifting my spirits and putting rain-sodden Manchester to shame. 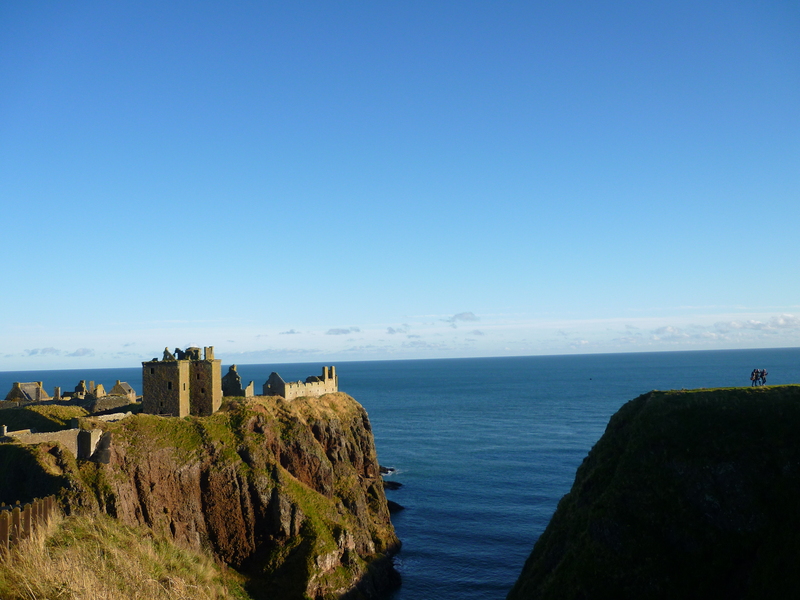 Did you know that Aberdeen actually gets the most hours of sunshine in the UK?! It’s just not necessarily the warmest! Perhaps that’s the real reason why things always seemed, literally, sunnier up there! 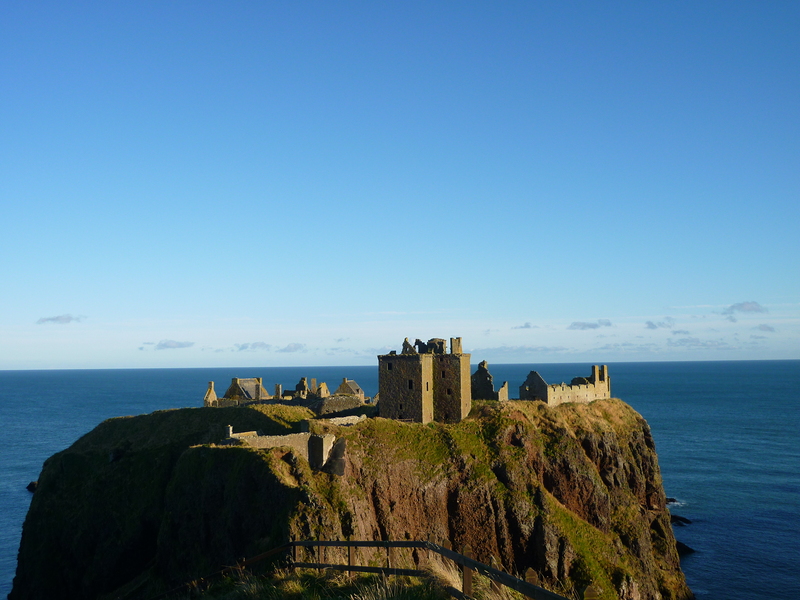 On the Saturday afternoon we drove just a little way out of the city to Dunnottar Castle, just outside Stonehaven. 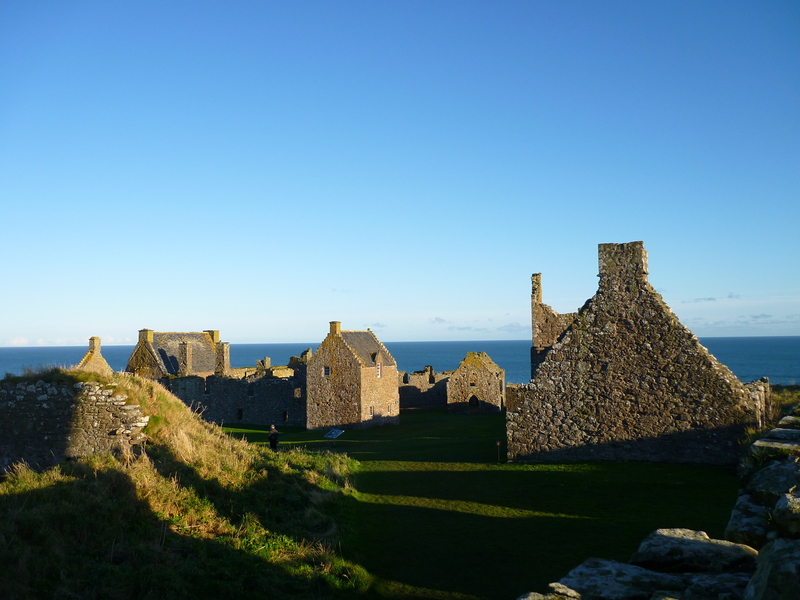 The castle is ruined but compared to many other ruined fortresses around the country still has an awful lot of its buildings vaguely in tact. 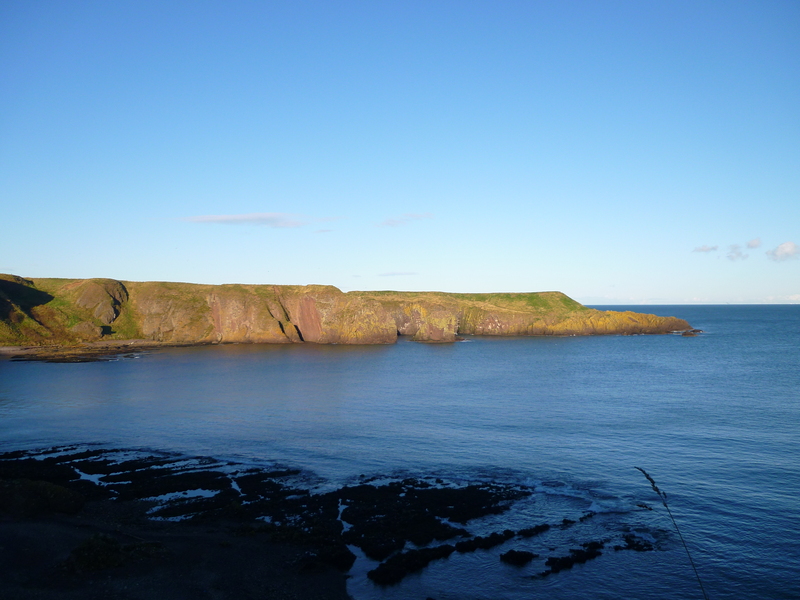 The location, on a strip of rocky headland sticking out into the blue North Sea, is stunning. 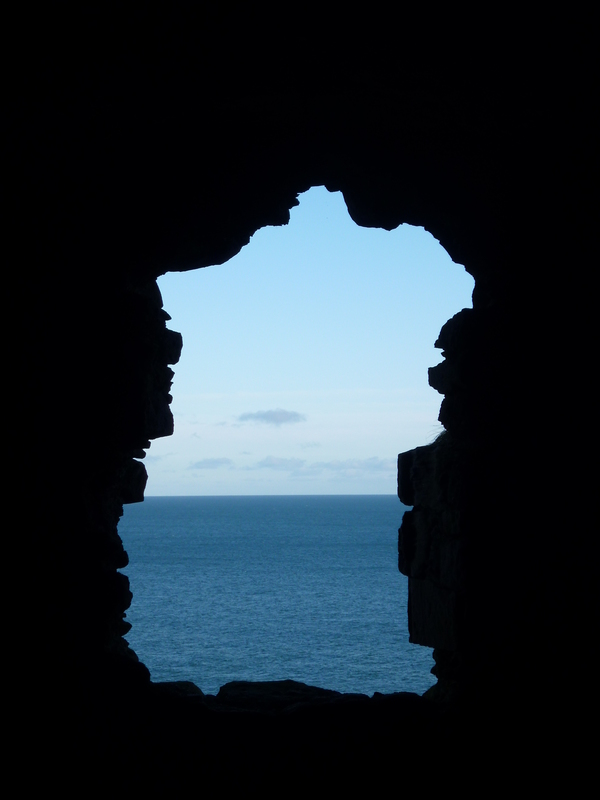 I stood in the castle gazing out of a “window” at the sea crashing against the rocks below, raising my eyes looking at the water stretching out into the horizon and marvelled at how the inhabitants would had admired the very same unchanging view many hundreds of years before. The castle’s location was clearly very strategic and therefore it was not surprising to learn that the Honours of Scotland, or the Scottish Crown Jewels, had been hidden here from Oliver Cromwell and his army during the seventeenth century. The beautiful cold sunny weather we enjoyed that day only added to the already spectacular, dramatic view. After our tasty marmalade chicken on Saturday night, the other half turned to me and asked what was for dessert. Hmmm. I knew we had two lonely cox’s apples rolling around the fruit bowl, and suggested we could bake them with some butter and brown sugar, and top with some honey and nuts. Tasty yes, but a crumble was being requested. 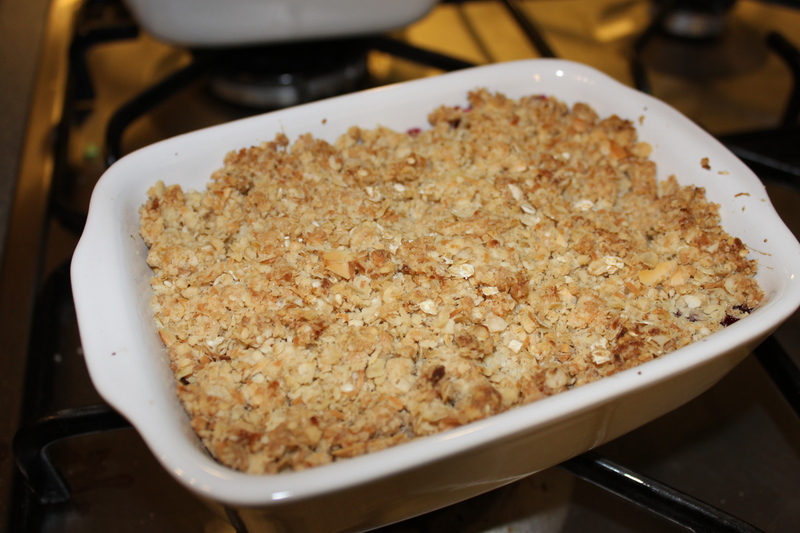 And who doesn’t love a good crumble? The only problem was that two little apples does not a crumble make! 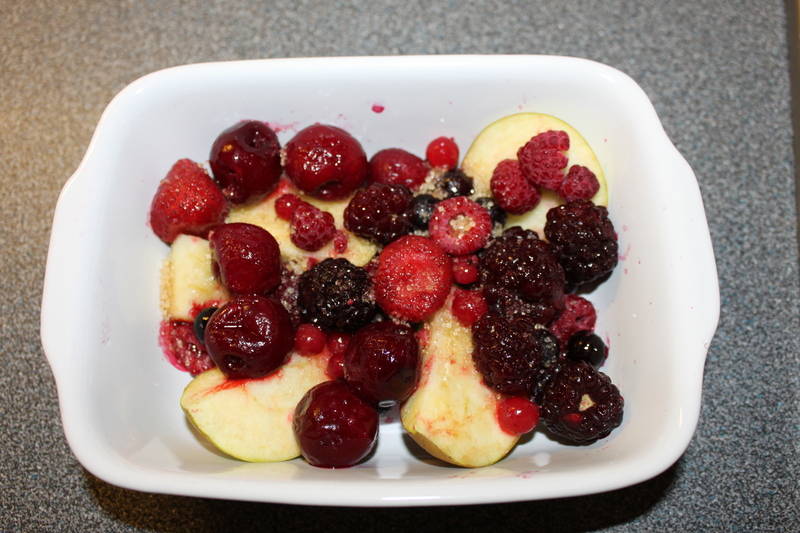 Luckily, Rob triumphantly announced that there were some mixed frozen berries in the freezer! 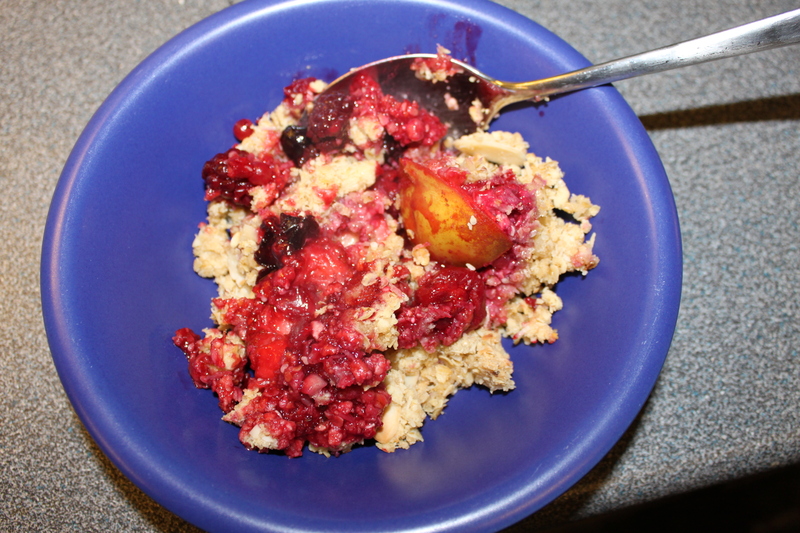 Normally if I were to make a an apple and berry crumble, I’d probably have a greater apple to berry ratio than the other way around, but the extra berry-ness worked really well. There were some delicious cherries in the mix and these were fantastic, they added a real tartness, which I love in a fruity desert. As a child we were brought up on regular crumbles – a great way to use up fruit and get yet more of the stuff into your kids! I remember phoning home from university and asking my mum to read out her recipe down the phone to me, and ever since then, it’s remained a firm favourite, which I too can now reel off by heart. We’d have many happy teas at home on a Sunday consisting of mum’s homemade soup and mum’s crumble – perfect, delicious comfort food! Most years we are lucky enough to receive copious amounts of apples from Rob’s family – his parents’ house used to have an orchard out the back and they still have a few particularly fruitful trees, the harvest of which is shared around family and friends and turned into a range of tasty desserts and chutneys – more often than not crumble in our house! Apple and bramble and apple and plum are probably my two favourite combinations, but the possibilities are fairly endless! So, I’m not going to share my mum’s exact ‘secret recipe’ but the basic premise is this – don’t just stick to boring old flour, sugar and butter! Reduce the amount of flour you would normally use, and once you’ve rubbed your butter into it, top it up with a good variety of tasty textured ingredients including a decent lot of porridge oats! Think (pre-toasted, it really is worth the extra effort!) sesame seeds and dedicated coconut, flaked almonds, chopped nuts, sunflower seeds… whatever you fancy really. Also, the sugar should always be demerara and, in my opinion, should be less than most recipes suggest – I don’t like my crumbles too sweet! 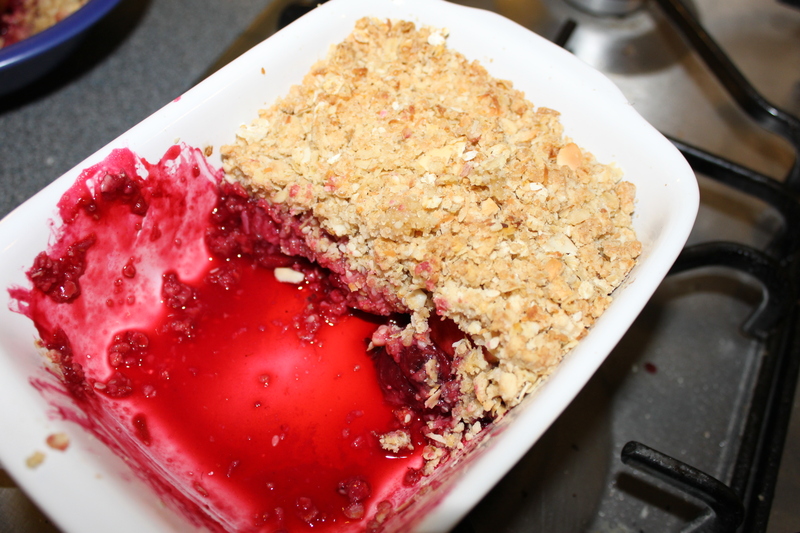 So, here are a few pictures of our first crumble of the year, to get you in the mood for winter! I’m sure there will be many, many more as the months progress! 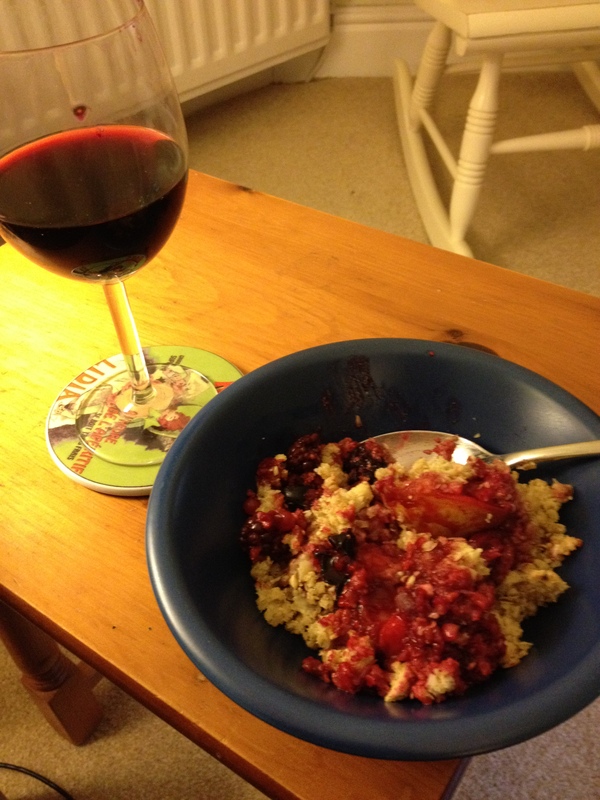 How do you like to make your crumbles? So after all my weekends here, there and everywhere, and after numerous visitors have been and gone, we have finally enjoyed a weekend to ourselves with few concrete plans – bliss! We’ve slept in, ate toast and tea in bed with the papers, started our Christmas shopping, cleared out the monstrous dining room cupboard, and Rob has made me some more picture frames out of bits of old picture rail. 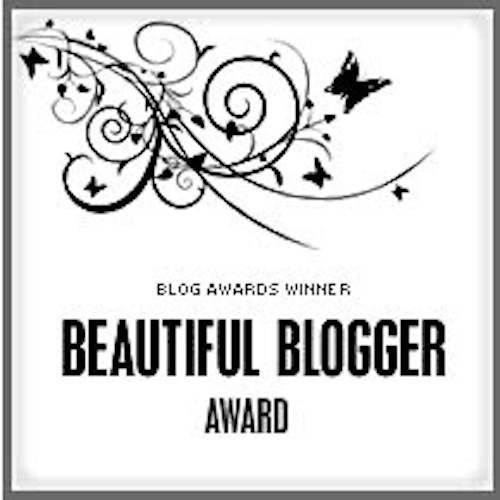 I have also finally had a chance to make something worth blogging about! 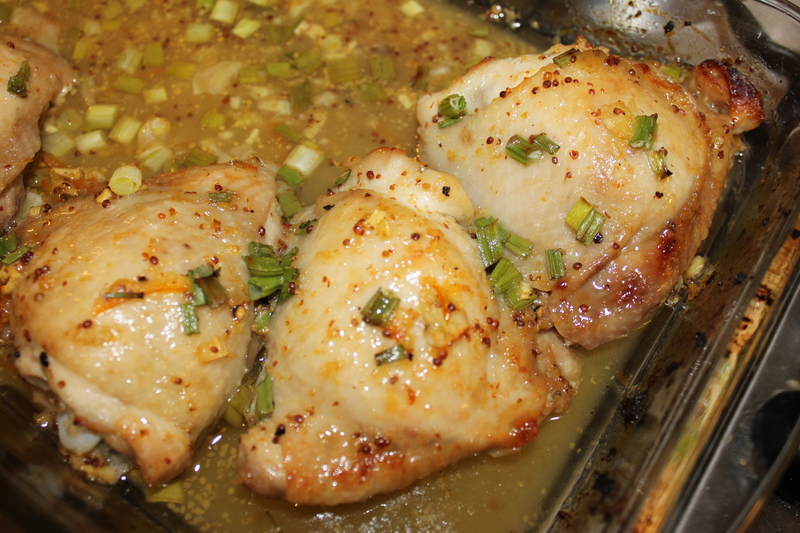 This is a recipe quite often made in our family, first introduced to us by my Uncle Keith. I love it because it’s a really easy recipe, and the result is impressive given the small amount of effort you have to put in! Then all you do is bake in the oven (covered) at 180 degrees for around 20 minutes. 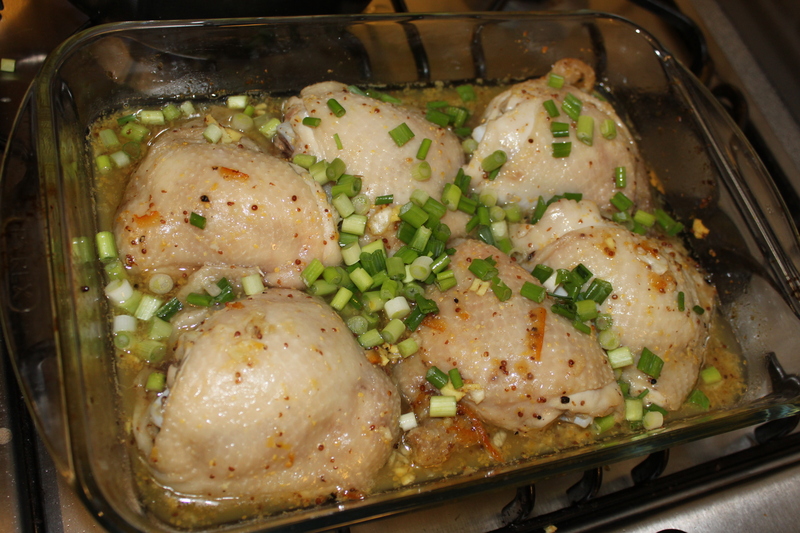 After the 20 mins, take out, give it a stir and spoon the marinade over the chicken pieces a few times, then toss in a decent handful of chopped spring onions. Pop back in the oven, this time uncovered, for another 15-20 minutes. Sometimes if I think the chicken skin looks like it could take a bit of crisping up, I’ll toss the chicken pieces into a hot frying pan for a minute or so. 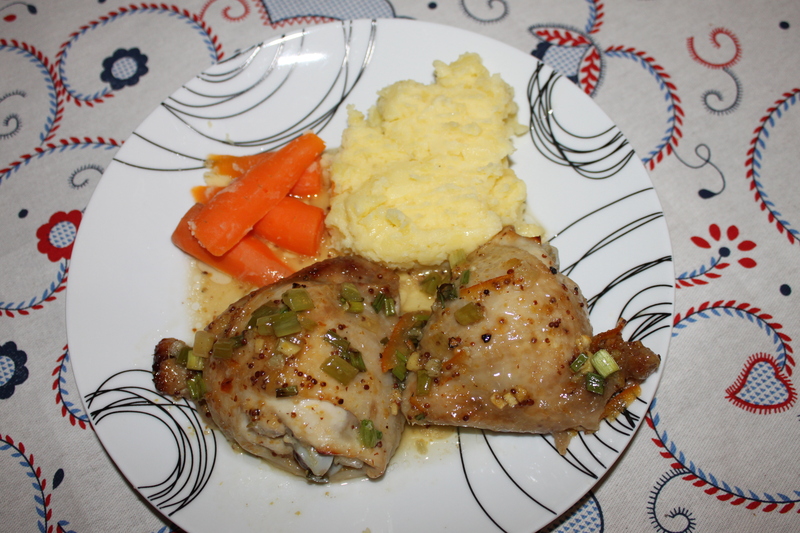 I like to serve this with mashed potato, green beans and carrots, except the fridge was a little bare, so it was minus the green beans! 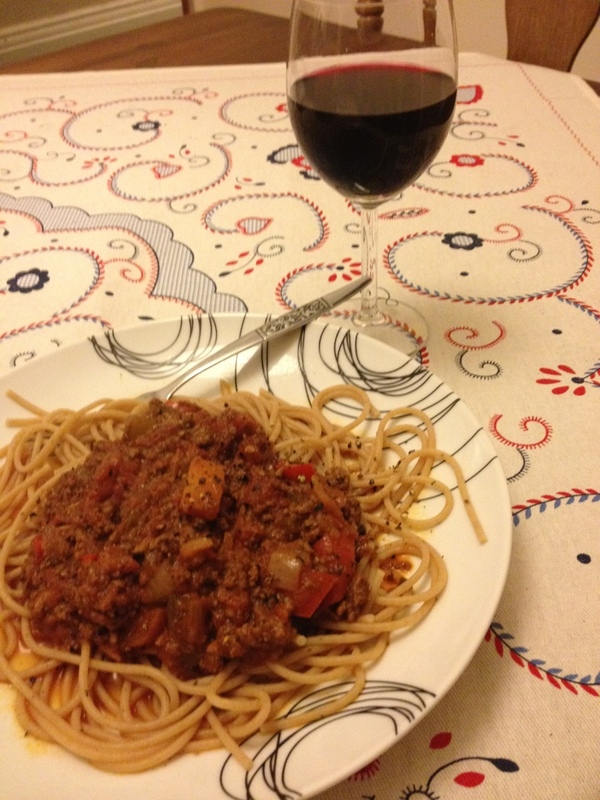 … is a big old plate of spag bol and a big old glass of Merlot! 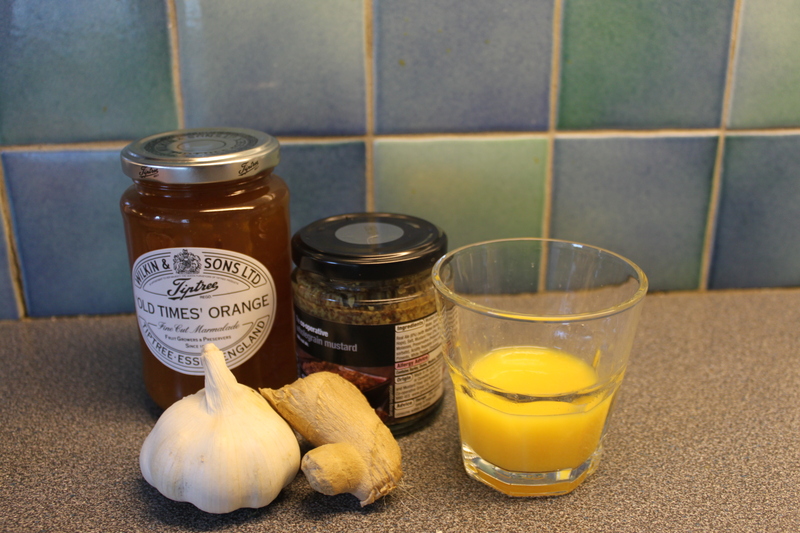 Testing out blogging as a phone upload…! Yes, I have been away for yet another weekend. 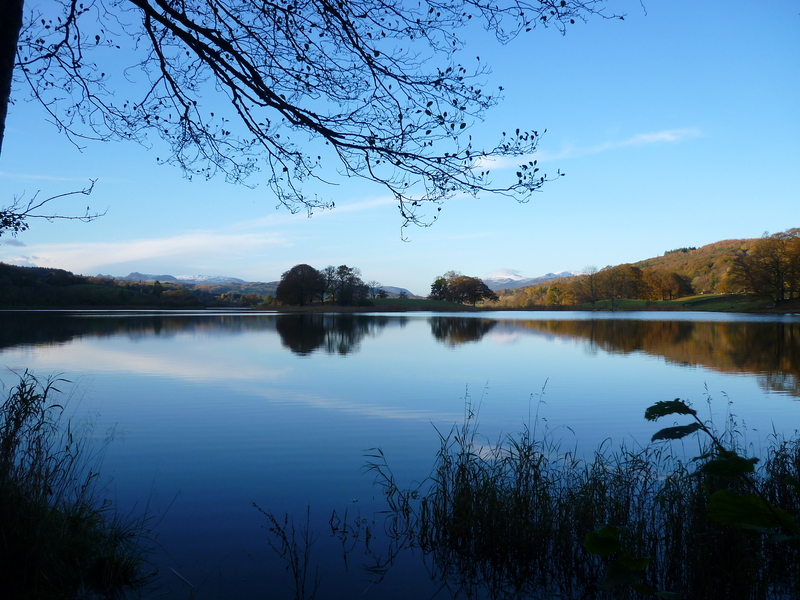 This time to a lovely cottage in the little village of Near Sawrey (the home of Beatrix Potter! Such happy childhood memories!) in the Lake District with the in-laws for a family birthday. All these weekends away to the countryside have been fantastic, I think it’s very healthy to get away from the city and daily grind as frequently as possible for some clean fresh air, exercise and relaxation. 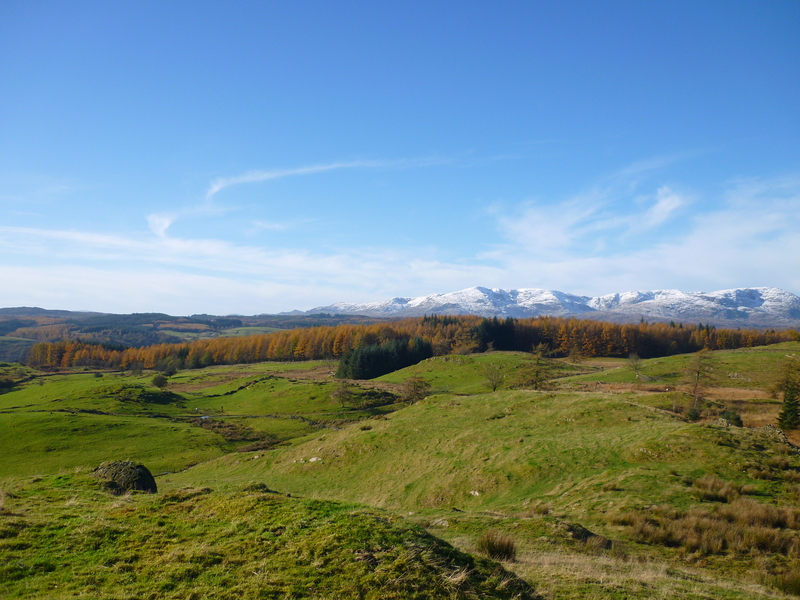 It makes me thankful to be in such easy striking distance of countryside in the Lake District, Peak District and Yorkshire living in Manchester – you really can have the best of both worlds! 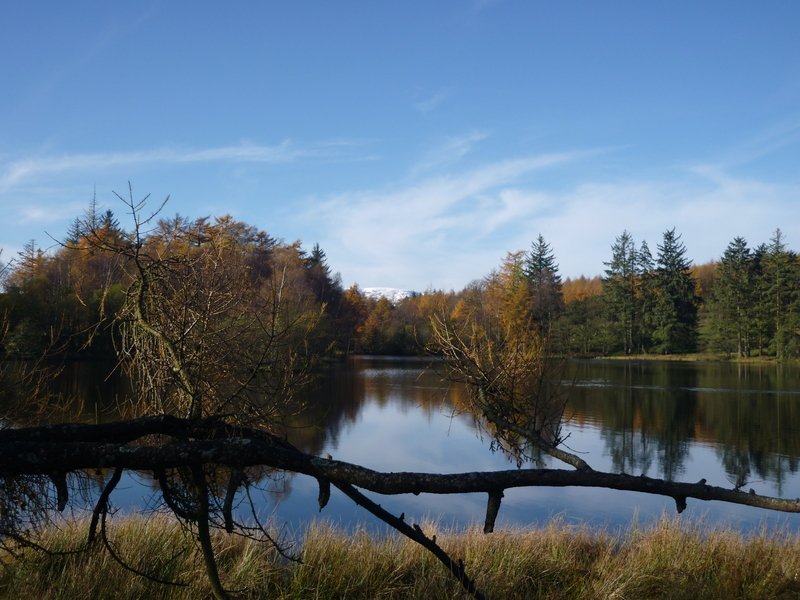 And if you can be as lucky as we have at this time of year to get some true cold, crisp sunny Autumnal days, you can enjoy some truly spectacular scenery. Aside from weekends away, the last few weeks have also been full of visitors and the likes of murder mysteries as well as general day to day manicness! This has all meant I’ve hardly spent anytime in the kitchen lately other than to whip up quick but relatively unexciting week night meals (think omelettes stir fries and baked potatoes!) I’m looking forward to getting back into the kitchen soon, but in the meantime can’t really complain when I’ve been enjoying more stunning views like this!